Severe weather from 2012’s Hurricane Sandy continues to affect the mid-Atlantic region. After the storm made landfall in 2012, the New Jersey Naval Museum in Hackensack, N.J., was severely damaged and has been closed to the public for the last five years. The artifacts inside were deteriorating due to the lack of proper environmental conditions, and several artifacts that were displayed outdoors were in need of major repairs. The decision was made to close the museum and remove the pieces to prevent further deterioration. Heritage Industrial Services was brought in to perform the rigging on the job. The growing rigging company based in Cream Ridge, N.J., has been servicing the New Jersey, Delaware, Pennsylvania, and Maryland area for the last five years. 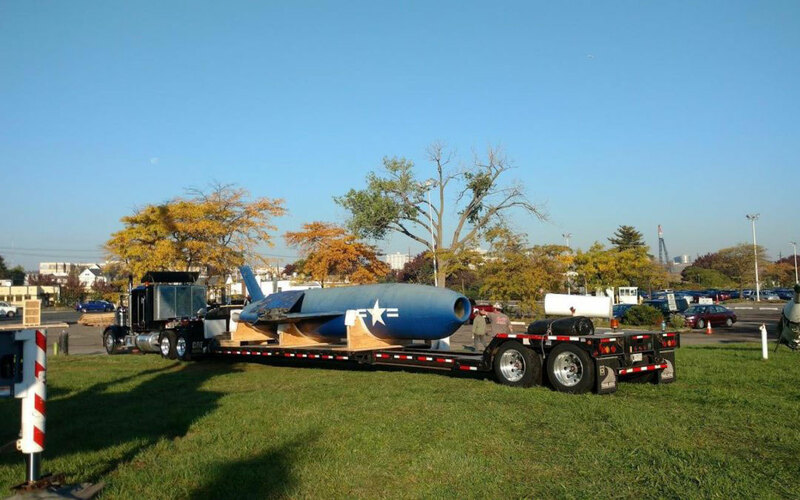 The company was hired to prepare the items for their move to the Washington Navy Yard in Richmond, Va.
Artifacts that were removed included a Regulus 1 SSM-N-8A, the Navy’s first operational cruise missile; a Regulus 4 w/ Wheel Trailer; a Germany Seahund Submarine; a Japanese Kaiten II Submarine; a Patrol Boat; a submarine conning tower; three periscopes; a naval mine; an anchor; a sub-propeller; an MK 16 Mod 1 underwater breathing apparatus; a Bofors Gun; a missile-guided terrier; SAM-N-7 / RIM-2 terrier missiles; an SN D115 Navy US Guided Missile; Talos SAM-N-6/RIM-8/MK 11 MOD 0 with booster; and a Navy US Model Missile Polaris A-1. In addition to rigging and moving the naval artifacts, Heritage Industrial Services also provided engineering and fabrication of a mobile stand for the Japanese Kaiten II submarine. Careful planning was performed prior to the project’s start, including critical lift and rigging plans for each crane pick to ensure that each lift was safe and wouldn’t damage the naval artifacts. Advanced Crane Services, Ringwood, N.J., brought in its 100-ton-capacity Terex AC 80-2 all-terrain crane equipped with 27,600 pounds of counterweight to perform the picks. Other equipment used on the project included a 12,000-pound-capacity Lull telescopic handler, rigging gear that included spreader bars, slings, and chain falls; and a rigging crew. The recovered naval artifacts were relocated to the Washington Navy Yard, where they will be assessed and receive as-needed restoration. Once restoration is complete, they will be put back on display for the public to once again enjoy. Paszkewicz said the project was completed safely, on schedule, and without incident.